Use this generator to generate a QR-code without having your precious WiFi information sent over the internet. Such a QR-code might, for example, be useful to allow your guests to easily add your WiFi network to their phone when visiting. 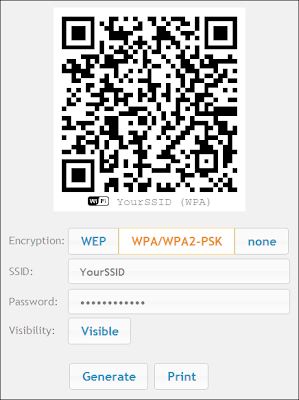 Select the encryption used in your network (WEP, WPA or none). Enter the password for the network. If the SSID is hidden, set the visibility button to 'Hidden'.